We had three more hours to enjoy Alton Towers this morning. I decided to stick with what I knew, and spent the entire period on Nemesis. Amazingly, rather than getting boring, the ride seemed to get better with each successive lap. There is no doubt in my mind that I now have a new favourite coaster. Drayton Manor is one of just two parks on this trip that I'd been to before, and indeed it was home to my first ever roller coaster in the guise of Shockwave. 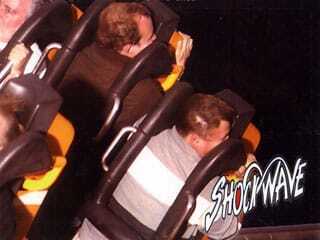 This was then and remains now the only stand up roller coaster in Europe. The park has a special perk available to members of coaster clubs, in that they are allowed to ride the coaster while facing backwards. This is quite frankly a crazy thing to do, as it is quite hard on ones neck and shoulders, but it is something that I don't regret having done once! My previous visit had left time for just one ride. Today wasn't much better, but I was at least able to ride the other coasters. My first was the powered Mountain Buffalo Coaster, a rather nice ride and arguably the best in the park at present. From there I made my way over to the Klondike Old Mine (#77). This coaster was not much fun, thanks to unforgiving restraints that bashed the side of my head. Apparently it is to be removed from the park in the near future, which won't be any great loss. Finally, I ticked off the Super Dragon (#78). Though nominally a kiddie coaster there were nevertheless more than two hundred other adults queueing to ride it; go figure!